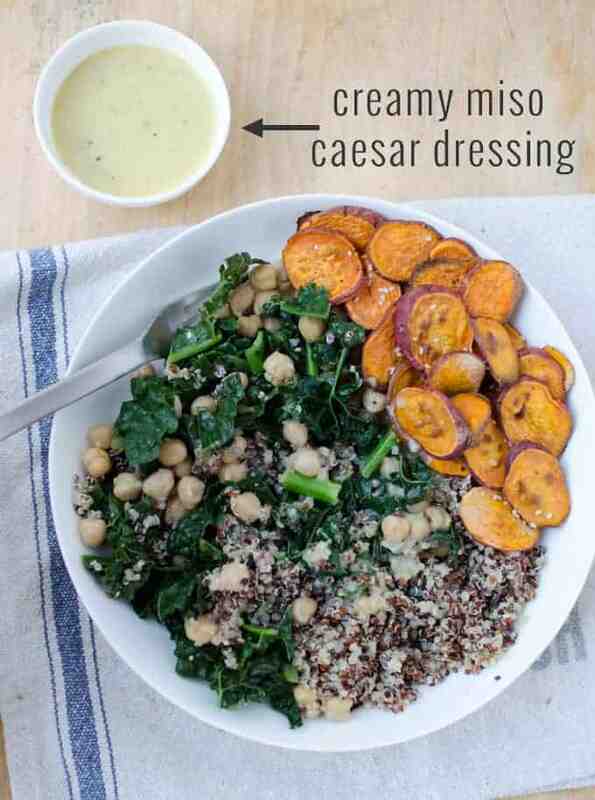 A vibrant, nutrient packed bowl of kale, chickpeas, sweet potatoes and quinoa, tossed with a creamy miso-caesar dressing. Each bowl is packed with protein, fiber & antioxidants! Get ready to face-plant directly into this bowl! If the phrase “you are what you eat” has any merit, you better start reaching for you super hero tights because you are going to feel like flying after this eating this power-packed bowl. When I talk to clients about the benefits of healthy eating, my first argument always centers around how the client feels. I’ve found that the biggest motivator for a diet change is a person’s desire to improve the way they feel. We’ve all had experiences where we eat too much or we consume the wrong types of food. As a result, we end up feeling sluggish, not feeling confident in our clothes, feeling like taking a nap after lunch, and so on. The connection between diet and mood is more than physical. It’s psychological, too. When you change your eating habits to include more plant-based foods, 99% of the time you are going to feel better. Which of course makes you want to keep performing the activity that has you feeling better. This bowl is the perfect place to start —> steamed kale, cooked quinoa, garbanzo beans, roasted sweet taters all topped with a dairy-free creamy miso dressing. I call it my power bowl, because it’s packed with goodness! Gluten-free, vegan, and contains 16g of protein per bowl. I have jumped on the quinoa bandwagon with both feet over the past few years as I love its versatility! On Sundays, when I do most of my meal prep for the week, I like to make a big batch of it to serve under stir fry, tuck into tacos, or pile on salads like this one. While I obviously eat a lot of gluten-filled foods (hello pasta! ), I can’t deny the “lightness” I feel when I include gluten-free grains into my diet. Finally- let’s talk about this dressing! Seriously, is there anything miso can’t do? Whenever I am creating a recipe and think it’s missing that something, I usually add a tad of miso. Kale is another one of those can’t-get-enough-of foods. But really any vegetable combo will work here. I make a batch of this dressing and use it on various salads throughout the week. As long as you have a combo of vegetables, beans and grains, the possibilities for bowls like this are endless. Place the sweet potato rounds on a parchment lined baking sheet. Lightly brush the sweet potatoes with the olive oil and sprinkle with salt. I use a pastry brush to lightly tap olive oil on each of the sweet potato rounds. Place the baking sheet in the oven and cook for 20 minutes. Flip over and cook for an additional 5 minutes until done. Place the quinoa and 1 cup water in a small saucepan and bring to a boil. Cover and reduce to low, simmer for 12 minutes until done. Fork to fluff and set aside. While the sweet potatoes and quinoa are cooking, set up a steamer. Lightly steam the kale for 5 minutes until bright green and slightly tender. Remove from steamer and set aside. Whisk together the miso with 1 tbsp. warm water. Stir until miso is dissolved. Whisk in the olive oil, lemon juice, minced garlic clove and pinch salt/pepper. Assemble! 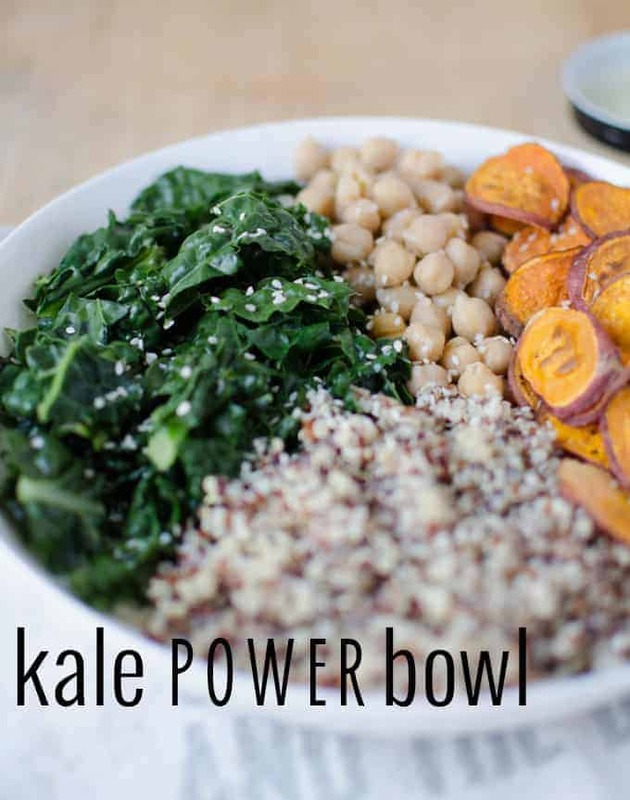 Place the steamed kale, garbanzo beans, quinoa and sweet potato rounds into a bowl. Drizzle with miso dressing! What are your favorite feel good meals? It says a lot about how far I’ve come from my former eating habits to say that this is the kind of meal I adore. Beautiful, Alex! Isn’t it amazing how much taste buds can change overtime? I am constantly amazed at myself when I turn down desserts for being “too sweet”. Like, did that just really happen? A powerful testament to healthy eating! Thanks for the comment Annie! This looks amazing! Everything I love in a bowl and with a beautiful miso dressing!? You had me at miso! Mi-So happy to hear that Katie! I adore a good bowl!!! Sweet potatoes and kale are my favourite veggies together. They play perfectly off of one another. And I agree about the miso! It’s like the magic ingredient, even if you’re not going the Asian-flavouring route. It’s so complex and salty. Love this bowl! Faceplant-worthy, indeed! Nice one. This is a dinner contender for the week! I always love big vegetarian bowls! The sliced baked sweet potatoes is such a good idea! I usually just chop it up into chunks! I just made this for my lunch and it was *delicious*!! My new favourite salad. I can’t wait for lunch tomorrow! Awesome! So happy- love hearing this, thanks for the comment!